If you haven’t gone through it already, you just might. I spent a bunch of money on motherboards recently and they all seem to be having the same problem. Is it because they just don’t make them like they used to? I am referring to the active cooling on my Northbridge; the fans keep making funny noises then crapping out. It drives me crazy. Usually though, the active cooling on the Northbridge was always sub par any way; just enough to get by. With all the advancements in mobos, the cooling solutions have been getting more and more important. So with two fans going on two different motherboards, what options do we have left? Thermaltake not only has an answer, they claim they have a better solution than was shipped with the motherboard in the first place. Enter the Extreme Spirit II. The Extreme Spirit II looks like a miniature version of the extreme cooling towers some of us use to cool our processors. 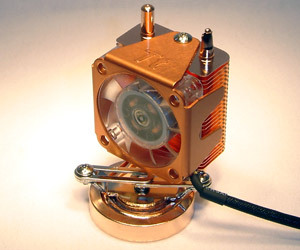 The unit boasts a universal installation for all motherboard designs and even uses a heat pipe for improved cooling. The unit is quite large for a Northbridge cooling solution at 48x40x70 and utilizes a 40mm fan pushing 3.47 CFM. 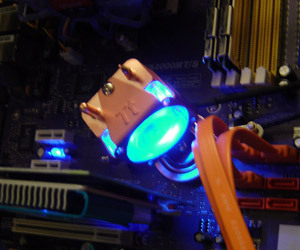 The fan is powered by a 3 pin connection and can be monitored by your motherboard. 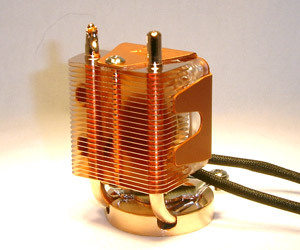 The entire piece is manufactured from copper and weighs in at a hefty 169g and uses 25 fins for cooling. One of the neatest features of this unit is that it allows you to spin the cooler to maximize the airflow in your chassis. That is right; the clip will rotate so you don’t have to suffer from a fan working in the wrong direction of airflow within your case. This has the potential to greatly increase the effectiveness of cooling. “Easy” is important when it comes to installing components. I don’t like having to do unnecessary work to get things working properly. The design here does not require any modification of the actual unit for installation in clip environments or mounting holes environments. The unit is shipped with the hardware to mount in either environment. The instructions are very well detailed and explain the installation process very well. Granted the pictures are small, but they do not detract from the guide itself. I have read rumblings of this unit being difficult to install and I must put them to rest. The difficulty lies in the installer, not the installed. The Extreme Spirit II is not meant to be easily installed, using the clip design, with your chassis standing upright. It is just too cumbersome so lay the chassis down and life is good. For testing, I placed a thermal probe next to the core on the NB of my ECS-KN1 Extreme and took readings during testing. Idle tests are temps taken while the system isn’t doing anything. For load testing I used Prime95’s torture test while Folding@home was running. I noticed some oddities while testing that would lead me to believe that there really is not difference in temps when running these apps. If the temp inside the case rises, obviously the temps probed will rise. These readings came to play when running the CPU at 100% during the load testing. While probing with the side panel off there were no differences between idle and load temps during idle and load testing for either the Extreme Spirit II or the cooler provide by the motherboard manufacturer. 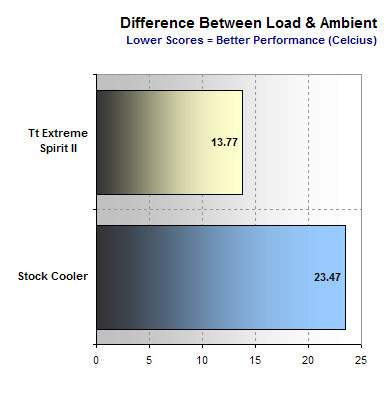 The Extreme Spirit II simply outperformed the stock cooler by extraordinary measures. There is a 10C difference between the two units. I can easily say here that I am thoroughly impressed with the unit that Tt has engineered. The Extreme Spirit II outperforms the stock unit and does so with a simple installation and a small price tag. The unit is sleek and visibly appealing. The fan on the Extreme Spirit II is barely audible while the system is operating and glows a nice blue while cooling your chipset. Bottom line, would I buy one? If my stock chipset cooling solution was failing or not performing well enough, HELL YEAH I WOULD!